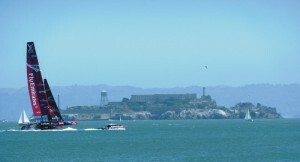 America’s Cup contestants in San Francisco Bay with famous Alcatraz Island in the background. Many view San Francisco as the mythical city of Oz. They picture fog rolling in from the Pacific, embracing the Golden Gate Bridge (it’s actually orange) while in their heads the voice of Tony Bennett sings endlessly about leaving his heart there. Union Square is the center of this universe. Fisherman’s Wharf is famous world-wide and with so many diverse restaurants, San Francisco is nirvana for gourmands and gluttons. The city’s excellent surface transportation allows visitors to park their cars and forget them during their visit, something you really want to do when touring a city where traffic is a bear. Those spectacular movie car chases are a Hollywood fantasy, all but impossible on the crowded streets. Open-top double-decker tour buses offer unparalleled views of Chinatown, Haight-Ashberry (the center of the “make love, not war” era of the ’60s), crooked Lombard Street, and so much more. These hop-on/hop-off tour buses give riders the flexibility to set their own schedules. Visitors learn that the famous cable cars are actually used by locals going about their daily lives and are not just operated for the amusement of tourists. Getting back to that famous San Francisco fog … during my first trip to the city, I went to dinner just a few blocks from my hotel. It was a balmy August evening and lightweight summer clothing was the order of the day. While dining, the fog moved in. When leaving the restaurant, I discovered the weather had turned from balmy summer to cold, raw winter in the blink of an eye. It was a very quick trip back to my room and was the coldest summer evening I have ever experienced. 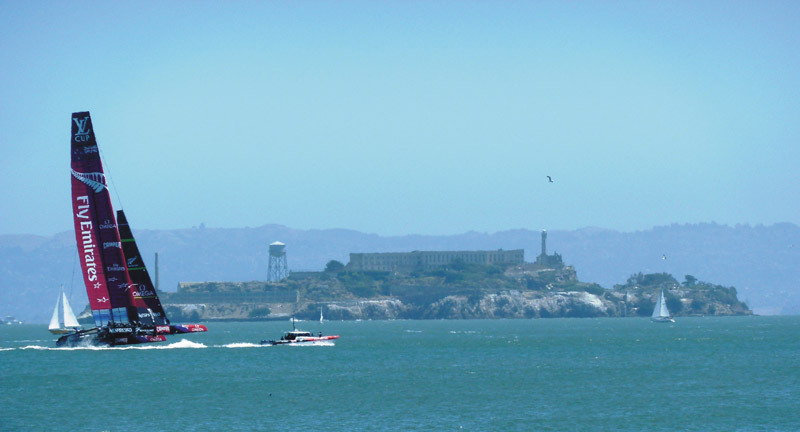 One of the newest attractions is the ferry ride to, and tour of, Alcatraz Island. It is also one of the most difficult tickets to get. If this is on your schedule, book days or weeks ahead or get to the ticket booth in the morning before it opens and hope for a cancellation. Something else visitors should be aware of: there is a toll charged to cross the Golden Gate Bridge from north to south and it MUST be prepaid. They do not take cash. Check the Internet for the regulations. If you are traveling south to north, congratulations, you’ve beaten the system. No toll is collected for cars leaving the city. ‘The Bridge’ connects the northern and southern parts of the 75,000 acre Golden Gate National Recreation Area where the Pacific Ocean meets San Francisco Bay. It encompasses Muir Woods to the north, The Esplanade to the south, Alcatraz to the east, Lands End and the Pacific Ocean to the west plus national parks, beaches, hiking trails, wild and scenic places, and so much more. Most out-of-state drivers heading over the famous Golden Gate Bridge have no idea of the rich history passing beneath them in an area ignored by most visitors. The southern end of the bridge soars high above the Presidio where in that auspicious year of 1776 a Spanish expeditionary force marched up the coast from Baja California, establishing presidios (military outposts) along the way. It was during this trip that San Francisco Bay was first seen by Europeans. June of 1776 marks the year the Spanish built and dedicated the Presidio de San Francisco. It was to be the northernmost expansion of Spanish rule in America. In 1821 the newly independent Republic of Mexico included the Presidio as part of its territory. The United States and Mexico were at war when, in 1846, U.S. forces occupied the Presidio. A treaty in 1848 transferred California to the United States. Over the ensuing years, the Presidio served as the most important military installation on the West Coast and played a role in every conflict from the Civil War to the Persian Gulf War in 1991. For 200 years the Presidio was an active military fort used by three countries. It was also the oldest continuously active army post in U.S. history until deactivated in 1994 and turned over to the National Park Service. So unlike the San Francisco known for its crowds and hectic pace, the Presidio is an oasis of tranquility. Yes, it is part of the city, and there is so much to see and do that visitors can literally spend a couple of days sightseeing there. Touring the Presidio’s historic forts, buildings, hiking its trails, visiting the beaches on the bay or ocean side can be done on foot, interior bus or private car. A starting point would be the Presidio Visitor’s Center at the Main Post, the ‘heart of the Presidio,’ next door to Walt Disney’s Family Museum. Nearby are the headquarters of George Lucas (Star Wars), where a statue of Yoda greets visitors in thecourtyard. In the lobby are other Star Wars characters, which offer great photo opportunities. The park also features many restaurants and cafes. To experience it all would take more than a day and until 2012 there were no overnight facilities. That year the park’s first overnight accommodations, the Inn at the Presidio, centrally located in the Main Post area, opened for guests. The Inn at the Presidio offers a gracious alternative to the San Francisco lodging experience. Its exterior maintains the historic Georgian Revival style of the time when in the early 20th century it was the Presidio’s Bachelor Officers’ Quarter. The Inn at the Presidio is a proud member of Historic Hotels of America. The interior is comfortably contemporary with all of the modern conveniences and amenities one has come to expect of a fine inn. There are three, three-story connected buildings. The inviting main lobby and sitting area lead to a large dining room, once the officer’s mess hall. A total of only 22 spacious suites ensure visitors will enjoy a tranquil stay. Many suites have gas fireplaces. Views from the large operable windows range from the Golden Gate Bridge, to woods, historic buildings and the Parade Grounds of the Main Post. Complimentary buffet breakfasts in a city known for high prices is a treat as is the daily 5 p.m. wine and cheese reception around the outdoor fire ring, weather permitting. Even parking is free to guests. Yes, you can ‘enjoy’ your San Francisco experience amid the crowds and din of downtown or alternatively enjoy your stay in the country-in-the-city, only a bus ride away from the Center of the Universe.